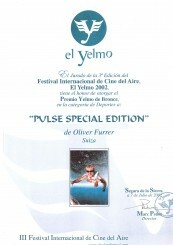 Over the last five years, Oliver Furrer has made several short films about different skydiving disciplines. Some of these videos were nominated at the “Coupe Icare film festival in St Hilaire”, the “El Yelmo – Festival Internacional de Cine del Aire” and at the "Vancouver International Film Festival". 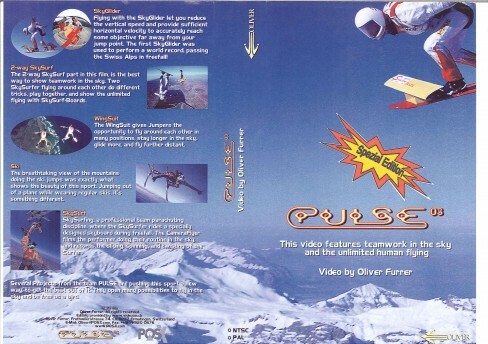 The PULSE 03 and PULSE SPEZIAL EDITION videos show off Oliver’s spectacular stunts on skyboards, skis, sky gliders and wing suits. Modern flying under a canopy, free flying at high speeds, or BASE jumping are some other techniques presented in Oliver Furrer’s films. The PULSE EVOLUTION DVD is currently available to purchase on the web-shop.